CEREMONY took place in 1964. Eric Avazian was playing basketball and his future wife, Linda, was rooting against him when they met 52 years ago at a competition between their church youth groups at Hollywood High. But the couple, who recently celebrated their 50th wedding anniversary with family and friends at the Wilshire Country Club, have been on the same side ever since. The pair, who learned they were the same age and had birthdays three weeks apart, began dating. “We went to a lot of frat parties, since I didn’t have any money to take her anyplace else,” said Eric. 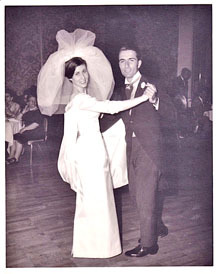 They became pinned, then engaged, and were married on Aug. 2, 1964. Linda, a graduate of Occidental College, put her husband through an MBA program while working at Pacific Telephone Co.
Later, he worked in the life insurance business while attending law school at night, and Linda became a stay-at-home mom to their three daughters, Monique, Danielle and Alexis. The family eventually settled in Hancock Park. Linda volunteered at her daughters’ schools and participated in community service activities while Eric built a law practice with his twin brother, Arthur. The party, said Linda, “was wonderful, just wonderful. We got to visit with friends we don’t see that often. We sang, we danced, we posed for pictures.” In the Club’s main dining room, the Avazians’ daughters paid tribute, along with their six grandchildren and many friends. 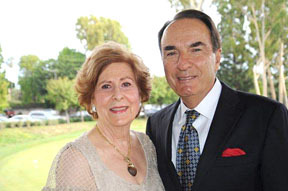 CELEBRATING 50 YEARS of marriage: Linda and Eric Avazian. Asked the secret to a long and happy marriage, Linda replied: “Know yourself and what matters to you, then find someone who shares those goals and values.